So we’ve had a short hiatus. Where have we been? Oh you know, a concoction of being caught in the trappings of every day life. Trying desperately hard to balance binge watching episodes of Sponge Bob Square Pants and work out what the HNC are going to do to fill their seven week league fixture gap? Well actually we do know what they are going to do in that gap and it mostly revolves around playing ball on foreign shores. 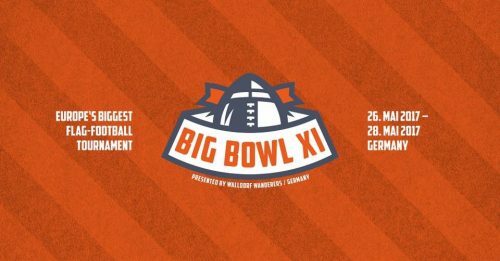 With Big Bowl just under two weeks away, it seems half of Scotland’s ballers are going to be plying their trade in Mörfielden, Walldorf. The Kirkcaldy Bulls have been attending this tournament, with various different line ups for many years. This year they add the hight and power of Glasgow Hornet, Julian Holburn White to the armoury. They lose Northants Titans Blue, Nathan Coles to the Allerød Armadillos this time around though. Elsewhere we will see the Chieftains and the Barbarians both taking part in this years instalment as well. The Chieftains made their debut in last years Big Bowl and with some success. But with the Barbarians also taking part, that’s around a third of the HNC making the trek as well. On June 24th, the Glasgow Hornets are also taking part in the Champions Bowl, in Klosterneuberg, Österreich, Austria. There are also various development days taking place in that gap in the schedule as well. 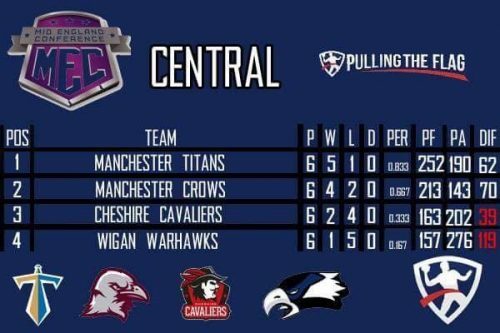 With the Carnegie Thunder and West Lothian Chargers having to pull out on the eve of the season, that lead to a quick restructure of the conferences, which in turn led to abridged schedules. 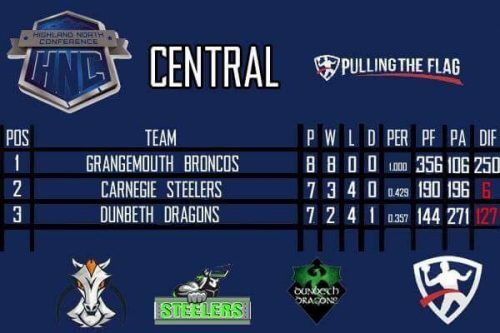 The Grangemouth Broncos have taken advantage of that schedule and have already claimed their division title. The acid test now is likely to be their last game of the season in which they will potentially be playing their last game of the regular season for the number one seed, against the Glasgow Hornets. 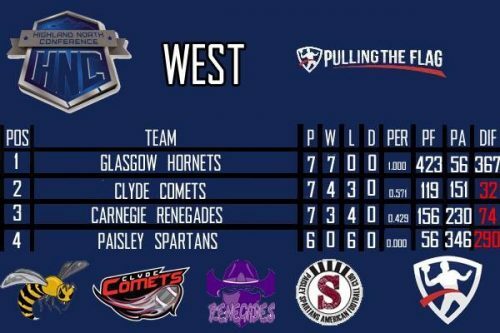 Now there’s an interesting wrinkle here, in that due to the nature of some of the results, most notedly, the 100 points that the Hornets put on the Paisley Spartans. There may be a situation where by the extreme net points difference of 367 could work heavily in the Hornets favour. How so? Well, if they were to go undefeated and edge the Broncos out, their superior net points would likely mean the playoffs will be going through Glasgow. To add a caveat though, Glasgow do have Aberdeen yet to play also. 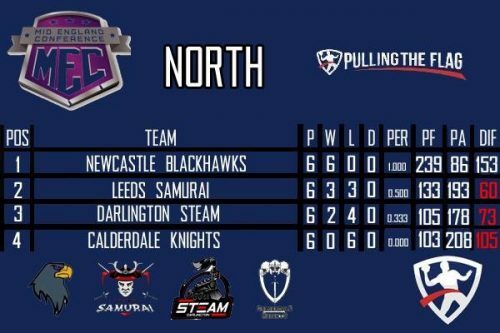 Unless the undefeated Newcastle Blackhawks or Sheffield Giants manage to rack up a boat load of points in their remaining games that is. With the Blackhawks and Giants meeting in their last game of the regular season, that looks likely to add value to the last game day fixtures. Not being disrespectful to the rest of the MEC, but if they fail to take games off of either team, both could go into that game with perfect records and likely be playing for the overall second seed in the North playoffs. Has BAFA adult flag football co-ordinator, Nick Bertenshaw got a crystal ball? To potentially match four undefeated teams and make it so their last games are set up for potential home advantage is either incredibly well planned or a slight of luck. Either way, the possibility is rather mouth watering. The SWC and SEC conferences are also looking to be taking shape too. In the SWC, the only undefeated team remaining is the Birmingham Lions, who sit at 6-0. 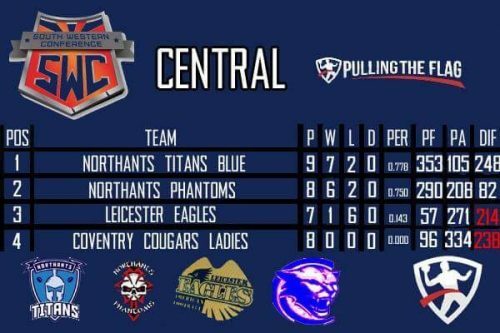 They’ve just this last weekend bested one of their nearest rivals in the Northants Titans Blue, winning 34-30 in a classic by all accounts. 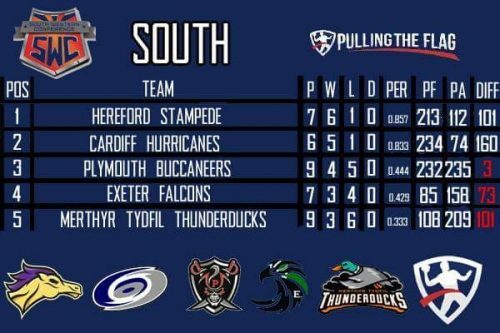 They’ve still got the Cardiff Hurricanes and Hereford Stampede to play, but those two look like they are taking lumps out of each other and will be primarily focused on winning their own division first and foremost. Hereford have the advantage in that respect having narrowly beaten the Hurricanes 26-24 in their first meeting. So own the head-to-head right now. 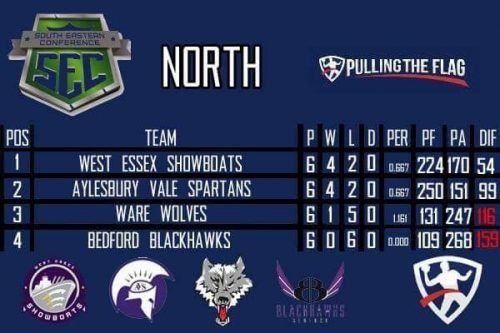 The Lions will likely have some say in that also, playing both on the last SWC game day, July 8th in Northampton. 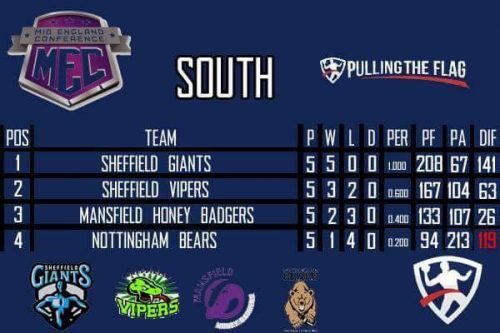 Add to that, the Cardiff Hurricanes also still have the Northants Titans Blue to play, who the Hereford Stampede have already beaten. It just gets better and better, eh? The only other 100% team left is the Baker Street Buttonhookers, from the SEC. 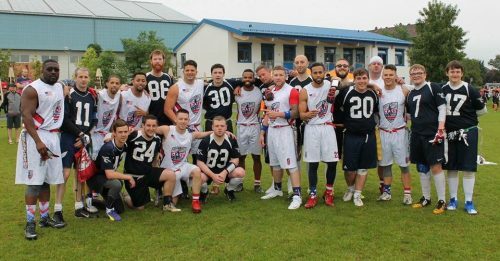 They are also 6-0 and have already taken the advantage away from the reigning champions, the London Rebels, with that 26-24 win on the 23rd of April. 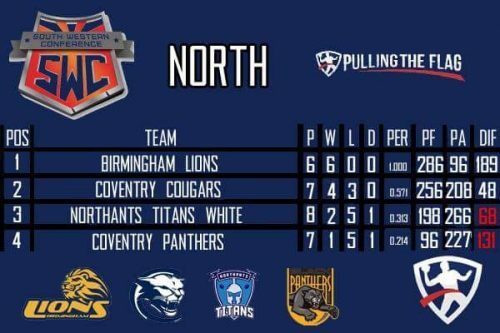 So if they can repeat in the return fixture, they could have a shot at going undefeated as well, thus giving us a potential net points situation between the Birmingham Lions and themselves for the right to host in the South. The Rebels can turn it all around with a win in the return fixture and could flip this whole narrative on it’s head mind you. 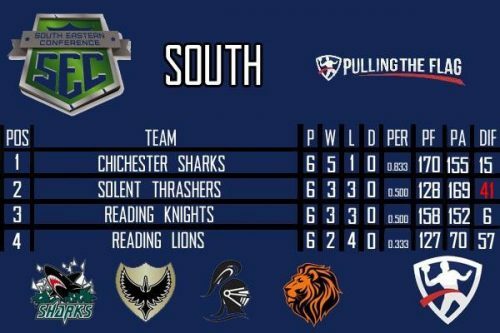 Not only that, but the likes of the Chichester Sharks, Reading Lions, Aylesbury Vale Spartans, West Essex Showboats and even division rivals the Victoria Park Panthers might have to say something about this. Obviously there are a lot of ifs and buts, but this is potentially shaping up to be a true battle of the big guns here, with net points potentially having a massive impact on how things could pan out. Hey rest of the league, we get that this may upset the rest of you and to that we say, go out and change the narrative of this thread! Hey, the league could have wedged in the first international series at Big Bowl. 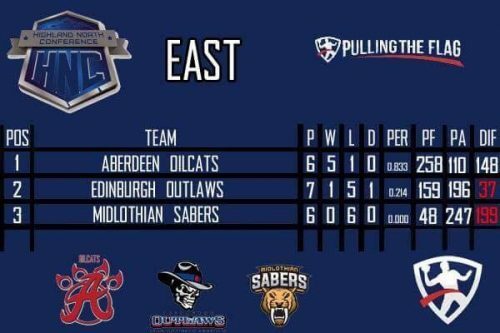 A third of the SEC Central will also be in attendence at Big Bowl, with the London Rebels, Victoria Park Panthers and Baker Street Buttonhookers going once more. Maybe there’s something in this? We could optimise the league season by sending all conferences to play one game day abroad? 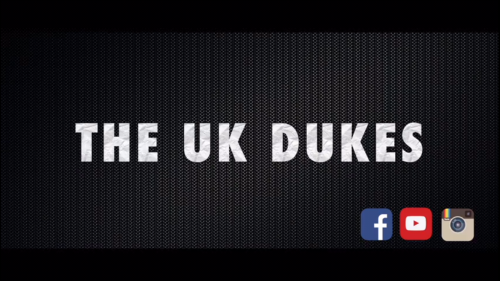 Charge the fans £80 a ticket, sell over priced consessions and Kenny Bello’s UK Dukes merch to the crowd too? Seriously though it’s no coincidence that all of last years finalists either went to Big Bowl or played in a team participating in it. Does the high standard of play help teams sharpen up their game? It’s certainly something we’ve noticed. Have you? Recently there was a thread on the BAFA Facebook page surrounding the question of the quality of the facilities of host teams. Being able to provide changing rooms and toilets for both genders is not always of high focus when you choose your playing area. But with the game being a mixed gender sport, it should be made mandatory for all hosting teams to have both these facilities at the bare minimum? 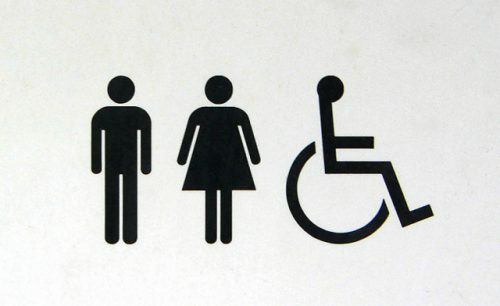 Are local parks, with nearby toilets or local pubs cutting it? The sport is supposed to be a cheap alternative to contact, but asking a female player to cross the road to the local pub is possibly breaching the inclusion and diversity un-written code, not to mention potential needed use for disabled spectators.